Our Ultra MC6A's are 6" mic cable adapters that go from xlr to 1/4" trs. These are made with Canare L-2T2S microphone cable. Please select xlr male or xlr female when ordering. The Xlr and 1/4" trs are from Neutrik. 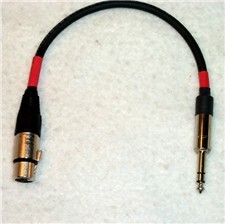 This cable is available in black (pictured), Red or Blue. You can choose different color shrink wrap to go at the cable ends. Colors available are; Red (pictured), Black, White, Blue.